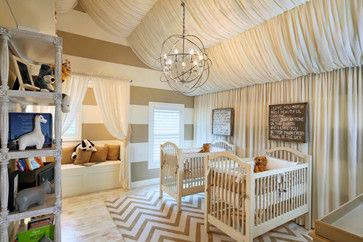 Whether you're expecting a baby boy or girl, this nursery design has you "covered" - literally, with fabric. Although the room has a gender-neutral color scheme, it has a soft and romantic feel to it. I love how fabric was used to soften and layer the room. It gives the room lots of texture, depth, and dimension, which is especially important since it is decorated in tonal colors. Fabric also helps with sound absorption, which is great for napping babies. The neutral color pallet is also calming. Raising kids is no easy matter. Anything to help promote rest and calmness helps! The various patterns that were introduced in this space also caught my eye. There are bold wide stripes on the walls (and repeated in the crib bedding), and a narrower chevron pattern on the floor rug. The sophisticated chandelier would also cast a beautiful pattern throughout the room when lit. Another aspect of this room that I love is that it could easily transition into a toddler, child, and teen room. All you would have to do is remove the cribs and toys through the years! Accent colors could also easily be injected into the room since the background is neutral. 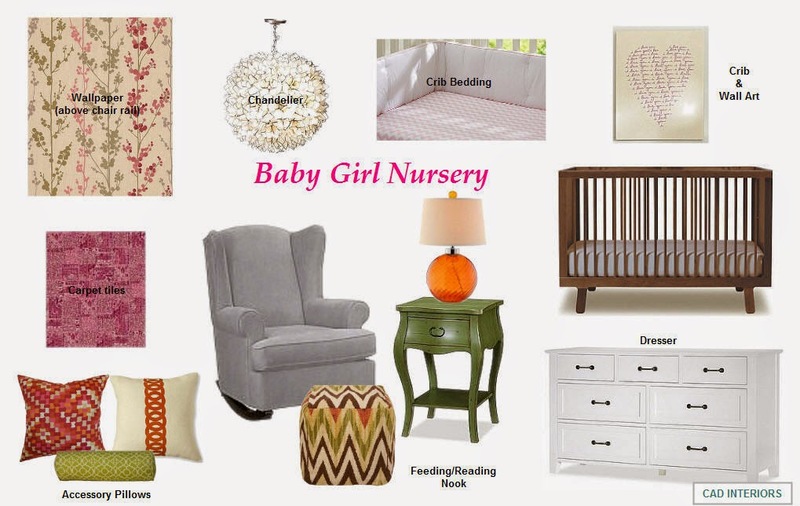 Here's my latest e-design for a baby girl nursery. It's soft, feminine, and a little sophisticated since mom would spend just as much time in the space.